Ambro.com works for companies that are not content to simply take orders. Our clients wish to influence advertisers to move their money from a competitor’s property to their own. Sure, our clients are happy to accept the flow of orders for advertising that comes easily, but leading franchises know that most advertising must be sold. And selling requires persuasion. And optimum persuasion involves storytelling. Advertisers are jaded. They think they know what they need to know about your property. Agencies are pressed for time. They think, “What more could they tell me about their magazine that I don’t’ know?” Whether it is Parade, or Popular Woodworking or Practicing Pediatrics, Yelp or Yahoo advertisers see it in mailbox or inbox or online, and they think they know all they need to know. How are you as sales people going to break through this complacency and make a difference? Top sales people tell stories because it engages customers and puts the sales message in a context that captures the prospect’s attention, perhaps even tugs at the prospect’s emotions. A story provides a structure that makes it easier to understand your pitch, and to remember it, so your prospect can recommend and defend your property when you are not in the room. When it comes to storytelling, the opening should be dramatic and personal. The beginning of the sales conversation should focus on dramatizing the needs of the readers. If the story is delivered in the right way, it captures the prospect’s attention and involves them in the drama of the story, communicates a sense of tension and then has them interested in learning the outcome. “Persuasion is the centerpiece of business activity. Customers must be convinced to buy your company’s services…and partners to sign the next deal” says the June 2003 issue of Harvard Business Review. Every publishing CEO should read a terrific article “Storytelling That Moves People: A Conversation with Screenwriting Coach Robert McKee.” It will help leaders capture the rapt attention of their audience in any situation. 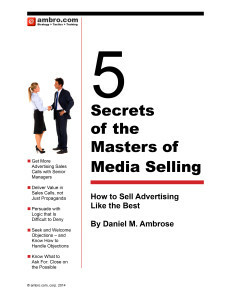 And in sales, the right story will dramatize the need for your magazine, cable show, conference or Internet property. Every publisher and sales person can develop his or her own story. Properly developed, it can be related in a variety of situations to dramatize the need for outdoor spectacular ads, for your magazine or Internet site, and the ways that audience uses your property and your advertiser’s products. Ambro.com can help you help your team each develop a story that works for them in their industry. An all-day workshop will help each sales person find a lead idea that will capture the attention of their prospects and provide a platform to relate the features and benefits of the media property in a way that comes alive.